The Skin barrier includes the outermost layers of skin; what you see on the surface. When that surface skin is healthy, it appears and feels smooth, soft, and plump (like a baby’s skin). In contrast, a damaged surface skin looks dry, rough, dull, and dehydrated. A damaged barrier may be the reason you get breakouts, are prone to dermatitis or even Rosacea. The positive here is that if you address what you are doing to your skin, add essential fatty acids - fish oils to your diet. Eat a healthy wholesome diet and drink plenty of water - your skin will respond favourably quickly . How your barrier functions is critical , when it is damaged, you will have difficulty trying to repair issues like wrinkles, post-acne red marks, dry skin, extra-sensitive skin, and breakouts etc. 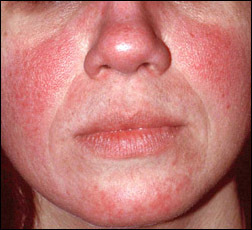 According to the National Rosacea Society, there’s growing research suggesting that an impaired barrier function could play a role in the sensitivity rosacea sufferers experience. What Damages the Skin's Barrier? • Don't use water that is too hot or too cold; both are irritating to skin. • Avoid soaking in water too much or for too long (the dry ‘prune’ looking skin post your bath is a sign of barrier damage). • Don’t use drying cleansers, including soap, which remove essential moisturising substances from your skin. • Don’t overdo it when it comes to products with high amounts of bio-active ingredients like AHA, BHA, retinol, or anti-acne medications. Find a concentration that works for you but doesn’t cause irritation, even if this means you don’t use the product daily. Nobody needs to exfoliate daily. • Avoid unprotected sun exposure, which can cause skin damage. How to Fix a Damaged Skin Barrier? If your skin’s barrier is already damaged – or you just want to make sure it doesn’t become that way – a using skincare products that will give your skin what it needs to heal is important. Pay attention to the ingredients in every step of your skincare routine. Healthy skin contains an abundance of these skin-repairing ingredients, so look for fatty acids, cholesterol, ceramides, hyaluronic acid, and glycerin in your skincare ingredients - you will find these in SkinCeutical Triple lipid restore. MetacellB3 which contains 5% Vitamin B3, commonly known as Niacinamide which helps reduce water loss in the skin and retain fatty acid levels (younger, plumper, firmer skin). It is also at high concentrations (between 3-4%) a very effective acne reducer. Clinical research has shown Niacinamide (Vitamin B3) to be just as effective as the topical antibiotic Clindamycin at treating acne. Avoid fragranced skincare. Gentle skincare is the way to go when trying to repair your skin’s barrier. Protect your skin from UV light every day. Sun exposure is one of the leading causes of impaired barrier function , so make certain you wear an antioxidant-rich sunscreen rated SPF 30 or greater every day. By following these steps, you can see calmer,smoother, softer, and less reactive more youthful looking skin.